Observation - Small Copper Butterfly - UK and Ireland. Description: Small Copper Butterfly observed on sunny September afternoon resting on the ground. This was the butterfly I saw that day except for a large white. Luckily it kept still long enough for the photo. 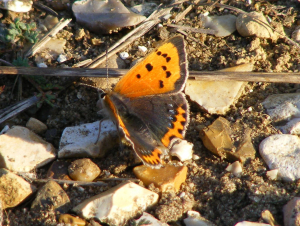 Small Copper Butterfly observed on sunny September afternoon resting on the ground. This was the butterfly I saw that day except for a large white. Luckily it kept still long enough for the photo.